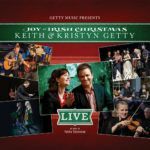 MUSIC BY KEITH GETTY, KRISTYN GETTY AND FIONÁN DE BARRA. LYRICS BY KRISTYN GETTY. And in this Child of breath divine our Light has finally come. She ponders how the Magi kneel before Emmanuel. With gold and frankincense and myrrh Christ’s sacrifice they tell. A dream would help them flee a king whose pride would cruelly destroy. As mothers weep God’s mercy meets the hunger for His joy. Her heart could tell His saving hand within this gift of love. A sword would pierce His mother’s soul upon redemption day. How suddenly a baby cried and all forever changed. Through history soul by soul have come to find His healing grace. He filled my troubled heart with peace, with hope of endless worth. My voice will join the song of praise that tells Messiah’s birth.